This post is sponsored by PlaytexBaby, as I explained in my post announcing the #PlaytexMoms partnership! 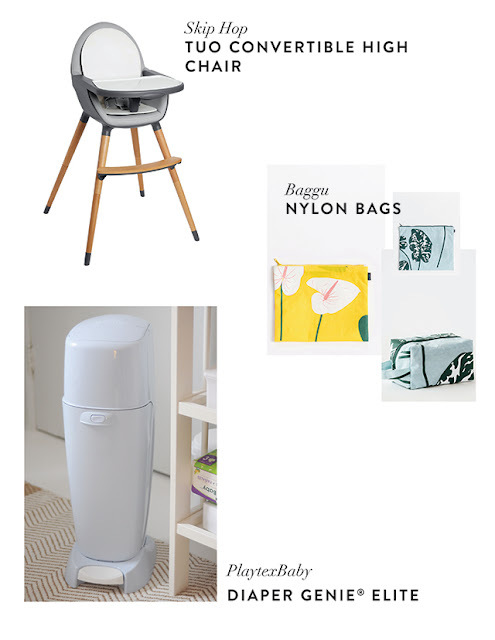 Back in November, I wrote about my baby essentials, and I am happy to say that most of it still holds true! We still adore our stroller, our carriers, and I have the white noise machine whirring away at this very moment. Now that Luca is nearly 10 months old, though (how!? ), we’ve outgrown a few things. 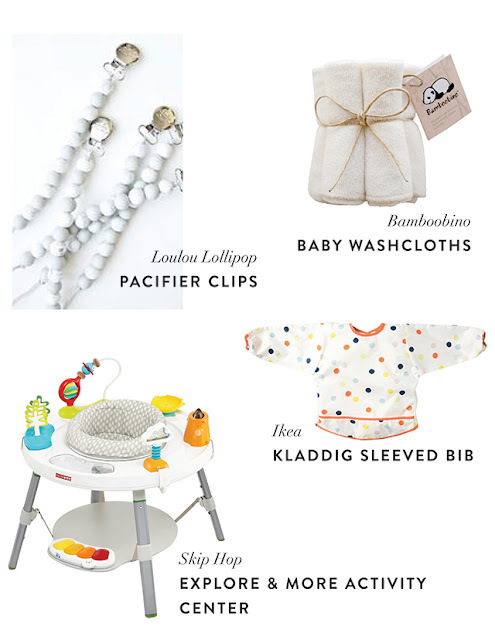 We no longer use the Solly Baby wrap or gripe water, for example, and Luca is more interested in board books than cloth books, but we’ve also added a few things. I thought I’d update the list. I’ve also decided to write about a few things that I personally found totally useless, because I am the queen of going overboard and I learned my lesson(s). Skip Hop DUO Convertible High Chair: We love this high chair! It’s stylish and modern and actually matches our dining room chairs pretty nicely. It’s not too large, and it’s also not too complicated to use. Best of all, it converts into a toddler chair for later use! I love baby items that have a long life span because those are quite rare. I thought high chairs were just for mealtimes but it’s a great place to put the baby while you make your morning coffee, or make dinner. Luca likes to sit in his and play with toys or eat some snacks. This chair is so easy to keep clean. Baggu Nylon Bags: These are perfect to use as wet bags! A good way to bring home wet or damp things without messing up everything else in your bag. Plus, so cute. Playtex® Diaper Genie® Elite: A classic for a reason! We had an (expensive, I should say) enamel can when Luca was first born and even though those early exclusively breastfed poops (sorry, can’t talk about diaper disposal without bringing up poop) were almost sweet-smelling, sometimes his nursery had a not-so-sweet smell that lingered. Since we got the Diaper Genie®, we haven’t had to worry about odours. These days Luca is crawling and tries to get into everything, but there is no way for him to get into the Diaper Genie® (believe me, he has tried). I love the gentle pastel colours it comes in! It’s also so easy to use and change. Easily available, it can be purchased at Amazon or Walmart. Bamboobino baby washcloths: A friend gave these to us as a baby shower gift, and they are the best! So soft. I tell friends who are putting their registry together to basically buy 100 soft tiny washcloths. They come in so handy for a variety of messes. Loulou Lollipop pacifier clips: I bought a few of these and ended up making some as well, but they are so useful! Luca used a pacifier for only a hot minute but these are good for attaching all manner of small toys to your stroller or car seat. Ikea Kladdig sleeved bib: Whoa, are mealtimes ever a disaster. A smock-like bib is the best kind of bib. These are inexpensive and easy to clean. Skip Hop Explore & More Activity Center: Okay, I know people refer to these as the “Circle of Neglect,” but it was great when I needed a minute to prep dinner or use the washroom. This one has a lot of wonderful things going for it: it isn’t too huge, it isn’t ugly, and best of all, it turns into a table (once again, I love baby gear that you can use for a few years)! Luca was pretty self-regulating when it came to this piece of equipment and he didn’t want to be in it for more than a few minutes at a time, so I didn’t have to worry that I was neglecting him. The first time I put him in it he went right for the little trees and was so happy. Now he mostly cruises around the sides. Special mention: books, books, books! I’ve been posting some of my favourite books on Instagram with the hashtag #fieldguidedreads. I don’t know how interested other people are but it’s fun for me! -Fancy swings. We bought one that cost a small fortune and looks like it’s from the future, and it most definitely did not work miracles for us. He rarely fell asleep in it and once he hit about 4 months, he started trying to sit up in it, which was kind of scary! We got the best results from bouncing him in our arms while sitting on a yoga ball. We also probably could have gotten away with one of the inexpensive swings, if we really wanted one. Every baby is different, of course, but I regretted that purchase, especially since I had to buy the infant insert to go with it (silly since it’s only used for infants!). -SOOOOOOOO MANY SWADDLES. I don’t know, we just didn’t swaddle him that much? We swaddled him when he was overtired in the first few months, and some babies really need to be swaddled, but I had been lead to believe that we needed so many swaddling blankets and we could have gotten away with owning maybe two swaddling blankets. 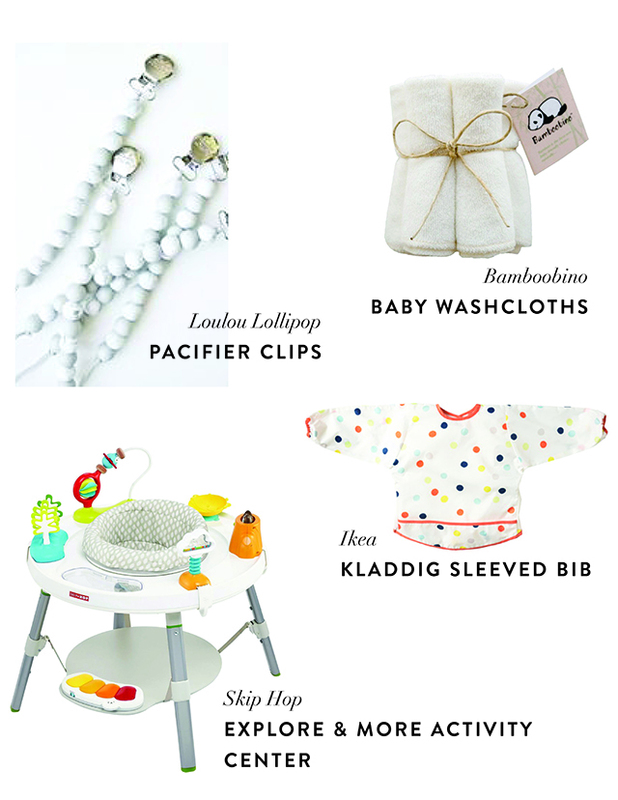 -Teething toys! Luca just isn’t much of a chewer. I have purchased so many cute things that he can chew on (a marbled heart, a wooden moon, frozen teethers, teething pads for the carriers, etc. ), and he really only chews on his fingers, if anything at all. This one really surprised me, I thought it was mandatory to own a Sophie la Giraffe! Maybe it will change but he’s cutting his top teeth now and still no chewing. So maybe hold off on buying every cute teething toy until you know how much your baby likes to chew. -Adorable and tiny baby sunglasses! He pretty much laughs at me when I try to put them on him and he pulls them off in an instant. Serves me right!